Bo and old friend Chuck Farneth decided to take advantage of a beautiful, early, spring day and do a little fly fishing on the Little Red River. 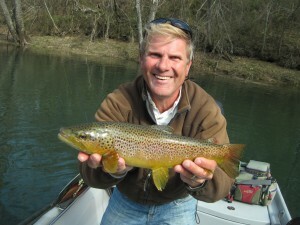 Chuck is a certified master casting instructor, the winner of the first ESPN’s Great Outdoor Games Fly Fishing Competition, and all around good guy. 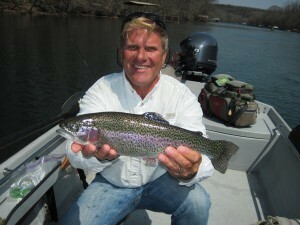 It is always a delight to spend a day on the water with Chuck. I guess because it is spring, green seemed to the fly color of the day. 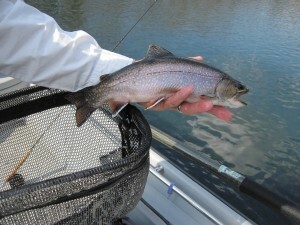 The streamer bite was on and the boys caught a number of slot Brown Trout on olive Chuck’s Chunks and olive Rouse’s Poodle streamers. 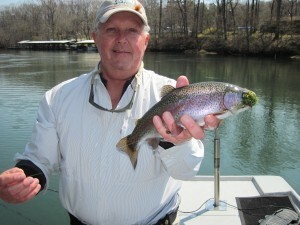 That is a Rouse Poodle Fly in the mouth of the Rainbow Trout below. Later in the afternoon the water started to drop and the guys changed tactics to size 12 March Brown Emergers and the Rainbows jumped all over them! Check out the gorgeous Brook Trout in the last photo. Chuck took that beauty on a March Brown and it is just a dandy Brookie that is really a prize. The fly fishing is only going to get better as we get further into spring and the Caddis hatch, obviously my favorite, should start on the Little Red River any day so don’t wait to book your fly fishing trip with Empty Creel Fly Fishing Guides and Outfitter.